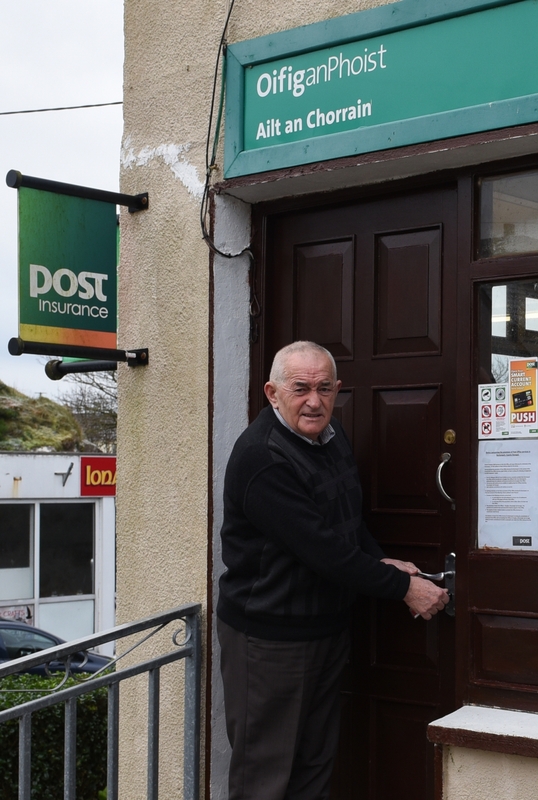 A former Donegal county councillor unleashed a stinging attack on An Post in the wake of the closure of yet another Donegal post office, the latest post office doors closing on Thursday evening in Burtonport. Veteran Fianna Fáil politician David Alcorn accused An Post of acting like a dictatorship. He said An Post had chosen not to listen to the wishes of the people of Burtonport. The fishing village is without a post office this week for the first time in over in two hundred years. Retired postmaster John Boyle,turned the key in the door of Burtonport postoffice at 5 pm on Thursday evening to bring and end to 232 years of a post office service in the fishing port. Mr Alcorn said the closure of the post office was “a shame and a disgrace”. He said the appeals process set up by An Post was “nothing short of a joke”. Mr Alcorn was a member of a special committee set up last year to save the post office and he said their appeal fell on deaf ears. “I would say without fear of contradiction that Patrick Bonner put together one of the best appeals before the appeals body, but it was to no avail and it made no difference to An Post. “The most disappointing thing for the people of Burtonport and the surrouding area is that we had a number of people willing to provide the service in the village. Staff and a large gathering of locals gathered for the last time on Thursday evening to mark the occasion. That out respect to those in their neighbouring parishes who were dealing with the treagic deaths of four young men, they had opted not to publicise their gathering. However, despite their low ley approach a large number of people gathered to show their support for the efforts made to try and retain the post office. “There was great sadness and there was a lot of emotion at the end of an era. The battle has been lost but there was no need to close the post office. Burtonport is a busy place and has a big hinterland. It is a disgraceful decision,” he said. It was the end of the line too for Arranmore Islander Danny ‘Neilly’ Boyle who collected the island post on a daily basis, a service he has been providing since 1984. Danny collected the Arranmore mail in Burtonport for the last time last Thursday. The Arranmore post will now be distruted from the Dungloe post office.